Historically, this time of year is when Goshen experiences the most flooding events. The city has accumulated a fair amount of snow that will equate to approximately an inch of water as it melts. With the rising temperatures this weekend and early next week, we will see a good deal of melting and the water will be looking for a place to go. Luckily there is not a substantial amount of rain expected but any that does fall will add to the melted snow totals. At this point, city crews are working to clear storm drains but many are still covered. In addition, the ground is frozen and will not soak up any additional moisture. The city is monitoring the situation in hopes of avoiding any flooding. In an effort to be proactive, the Street Department has sandbags available this afternoon for any Goshen residents who may need them and they will be available throughout the weekend, as well. Keep an eye on the City of Goshen, Indiana facebook page and our website at goshenindiana.org for any updates regarding the weather and further preparations in the event of flooding. This entry was posted in Hearings on February 1, 2019 by becky. – Pre-treat pavement with a small amount of liquid deicer. – Remove snow before it becomes ice or use a scraper or metal shovel to remove the ice. 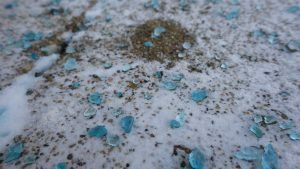 – If the pavement is too cold (less than 15°F) rock salt will not work and alternatives like sand or birdseed for traction or other deicers like magnesium chloride or calcium chloride can be used. – Use only the amount of salt and sand you need and sweep up any extra. For more information visit http://bit.ly/winter-sand. This entry was posted in News & Events on November 15, 2018 by becky. Use extra caution as many roadways may be more narrow than usual. There are many streets still lined with leaves along the curb line and the plows are unable to clear the snow to the curbs in these areas. Keep storm drains clear. Drains covered with leaves and now snow prevent water from entering and subsequently lead to standing water in the roadways. As temperatures drop again this evening, any standing water is likely to freeze causing additional hazards for tomorrow morning. Winter weather has definitely arrived and we thank you in advance for helping us and using extra caution while clean up is underway. Due to the 4th of July holiday, and to prevent as much confusion as possible, the City of Goshen and Borden WasteAway wish to remind residents that the garbage collection schedule for July 4, 5 and 6 will be delayed by one day. For example, the normal Wednesday route will be collected on Thursday, etc. Normal collection schedules will resume on Monday, July 9, 2018. Independence Day is observed by Goshen’s City and Utility employees, and all offices are closed on Wednesday, July 4. Offices will re-open on Thursday, July 5 at normally scheduled times. As the fireworks displays continue for the Independence Day celebration, it is important that Goshen residents be aware of fireworks regulations. A local city ordinance was adopted in 2007 at the urging of residents concerned about neighborhood safety and noise. Regulation is controlled by parameters imposed in state legislation. 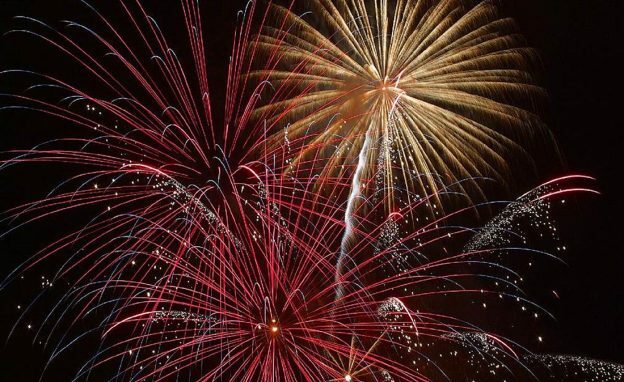 Consumer fireworks are allowed by state legislation and local ordinance from 5:00 p.m. until two hours after sunset (or until approximately 11:20 p.m.) thru July 9, except July 4 they are allowed from 10:00 a.m. until 12:00 midnight. Any other times require Board of Works approval and must be on real estate owned by a government entity. Fines for violations may be up to $500 per incident. To report a violation of the fireworks ordinance, citizens are welcome to call the non-emergency dispatch phone number—533.4151. The caller must supply an exact address of where the violation is occurring in order for a police officer to respond effectively to the call. Fireworks NOT limited to certain dates and times by local ordinance include dipped sticks or wire sparklers. However, total pyrotechnic composition may not exceed 100 grams/item and chlorate or perchlorate salts may not exceed 5 grams/item. Other items NOT regulated by local ordinance include cylindrical or cone fountains, illuminating torches, wheels, ground spinners, flitter sparklers, snakes or glow worms, smoke devices and trick noisemakers (i.e. party poppers, booby traps, snappers, trick matches, cigarette loads). Local regulations apply to “consumer fireworks” as defined in state statutes. Such fireworks include certain small ground or aerial devices designed to produce visible and/or audible effects by combustion. They are required to comply with the construction, chemical composition and labeling regulations of the United States Consumer Product Safety Commission under 16CFR1507. Ground devices (firecrackers, salutes and chasers) are limited to 50 milligrams of explosive composition. Aerial devices (sky rockets, missile type rockets, helicopters or spinners, roman candles, mines and shells) are limited to 130 milligrams of explosive composition. Larger devices are not allowed under local ordinance and require state permitting. This entry was posted in News & Events on July 3, 2018 by becky. This entry was posted in News & Events on July 2, 2018 by becky. The City of Goshen, in partnership with the Salvation Army, Maple City Chapel and Elkhart County Emergency Management, is working to provide resources for residents during this weekend’s extreme heat event. The National Weather Service has issued an Excessive Heat Warning for Elkhart County beginning at 12:00 p.m. today that will remain in effect until 8 p.m. Sunday. They are considering this a “Long Duration Extreme Heat Event” with temperatures rising into the mid-90’s today and lasting through Sunday with heat indices of up to 110 degrees. Temperatures will only drop into the 70’s at night with continued high humidity. They have also issued an Air Quality Alert as the ozone levels are expected to be dangerously high. • The Salvation Army, 1013 N. Main St., entering through the south entrance. The building will be open to the public Friday from 12:00 p.m. until 4:00 p.m., Saturday from 9:00 a.m. to 4:00 p.m. and Sunday from 9:00 a.m. until 12:00 p.m.
• Maple City Chapel, 2015 Lincolnway East. The center will be open to the public from 12:00 p.m. until 7:00 p.m. Friday, Saturday and Sunday. • Schrock Pavilion, 411 W. Plymouth Ave. The building will be open to the public on Sunday from 12:00 p.m. until 7:00 p.m. In addition, entrance into the City’s Shanklin Park Pool (411 W. Plymouth Ave.) will be free this evening through Sunday. Pool hours will be as follows and patrons must be in appropriate swim attire to be admitted into the facility. We encourage the community to utilize this resource as a means to stay cool throughout the weekend. • Friday – 6:00 p.m. until 8:00 p.m.
• Saturday – 12:00 p.m. until 7:00 p.m.
• Sunday – 12:00 p.m. until 7:00 p.m.
Mayor Jeremy Stutsman thanks both the Salvation Army and Maple City Chapel for opening the doors to the public in this time of need as well as Elkhart County Emergency Management for their assistance in providing resources for the cooling centers. The combination of extremely hot temperatures and high humidity will lead to an increased risk of heat related stress and illness. The public is advised to drink plenty of water, stay in an air-conditioned room, stay out of the sun and check on relatives and neighbors. This entry was posted in News & Events on June 29, 2018 by becky. Arrangements for honoring Chief Wade Branson have been confirmed. The visitation will be held on Saturday, June 30th, from 9:00 – 11:00 am at Grace Community Church, 20076 CR 36, Goshen, Indiana. The funeral will immediately follow at 11:00 am. A procession upon the conclusion of the funeral will proceed past the Goshen Police Department and continue to West Goshen Cemetery. 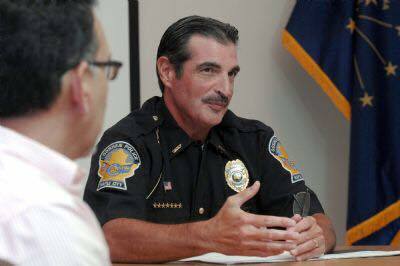 The passing of Chief Wade K. Branson has created a ripple effect of emotions far beyond the community of Goshen. Family, friends, City of Goshen staff, community members, acquaintances, other police agencies, and other communities, (the list goes on and on) have reached out to show their support for a truly amazing human, to his family, to his brothers and sisters at the PD and to our community. This support helps during a difficult time and means more than you know. On behalf of the community of Goshen I thank you for this incredible support! Saturday June 30th Chief Branson’s service will be held at 11:00am at Grace Community Church. We have come to realize there is no facility in Goshen that will be able to handle the crowd that wishes to attend and pay their respects. I would like to encourage everyone who is unable to attend the service to join your fellow community members along the procession route to pay your respects to Wade and show your gratitude to his family for all of his years of selfless service to Goshen. This will mean so much to the family and all involved. 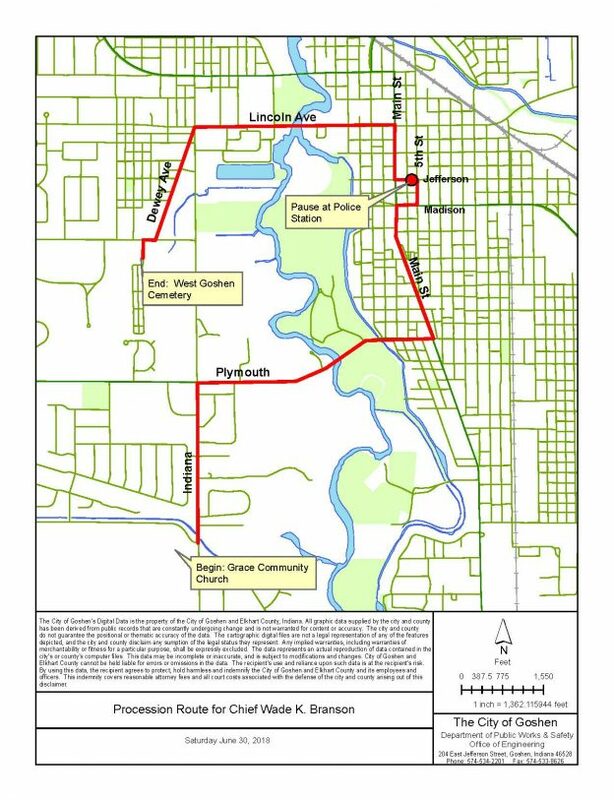 The procession will most likely begin around 11:50am-12:10pm (The safest place to do this is on a sidewalk or Main Street in Downtown Goshen). This entry was posted in News & Events on June 28, 2018 by becky. A Petition for Annexation into the City of Goshen has been filed with the Goshen Common Council requesting the annexation of certain real estate located outside the corporate limits of the City of Goshen. This area is identified as the “Goshen Community Schools Annexation Area” and consists of approximately 37 acres of real estate generally located north of State Road 119, west of Greene Road (County Road 19), and south of Berkey Avenue. 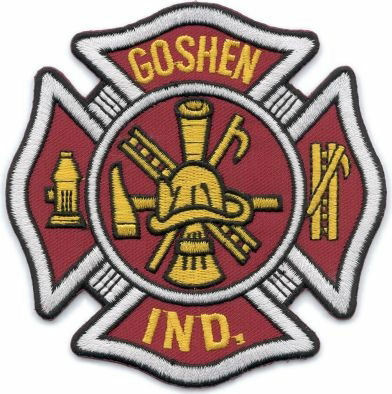 The Goshen Common Council will conduct a public hearing on the Goshen Community Schools Annexation at its regular meeting on August 7, 2018 at 7 p.m. The hearing will be held in the City Court Room/Council Chambers at the Goshen Police & Court Building, 111 East Jefferson Street, Goshen. All interested members of the public are invited to attend and will be given the opportunity to testify on the proposed annexation at the public hearing. This entry was posted in Public Notice on June 28, 2018 by becky. Date and Time of Meeting: Monday, July 2, 2018 at 4:00 p.m.
Pursuant to the provisions of the Open Door Law and Indiana Code 5 14 1.5 5, the Goshen Parks and Recreation Board will be holding a public meeting on July 2, 2018 at 4:00 p.m. The meeting will be held at the Rieth Interpretive Center, 410 West Plymouth Avenue.